Not generally found in traditional higher education, enrollment contracts—formal, legalistic agreements snuck into paperwork presented to incoming students—are designed to protect the financial interests of schools by limiting students' legal rights, should something go wrong. The types of restrictions placed upon incoming students by enrollment contracts fall into four basic categories: forced arbitration clauses, go-it-alone clauses, gag clauses, and internal process requirements. While restrictive clauses are frequently imposed by for-profit colleges participating in the federal financial aid program, they are used only rarely at traditional nonprofit colleges or at for-profit colleges not using federal funds, and almost never at public institutions. Click here to view all source documents mentioned in this report and survey. When students go to college, they are confronted with a flurry of paperwork—applications, financial aid forms, housing forms, and so on—all of which seems pretty routine. Increasingly, however, some schools have been including an additional form hidden in that stack of innocuous documents that is quite unlike the others: an enrollment contract. Not generally found in traditional higher education, these enrollment contracts—formal, legalistic agreements—include language that spells out the options each signee has in a range of situations, ones that probably appear purely hypothetical to most enrollees. One can forgive students—intent on a journey that they hope will change their lives in wonderful ways—for signing everything put in front of them, as quickly as they would click “agree” to the terms and conditions of an online app. The language in these enrollment contracts, however, has a very specific purpose: protecting the financial interests of the school by limiting a student’s legal rights, should something go wrong. This report examines the use of enrollment contracts by various colleges—specifically, those provisions that restrict the ways in which students and former students can seek any redress of grievances against these institutions, should they feel the need. It presents the results of a survey of postsecondary institutions, illustrating the basic types of restrictive provisions most frequently employed, the specific language typically used, the various agreements in which these restrictive provisions appear, and the sorts of schools that often have such contractual agreements. The report concludes with recommendations to address this insidious practice, followed by a table listing the data for each institution studied. Stories stemming from colleges’ use of enrollment contracts have appeared in the press with increasing frequency. These accounts follow a pretty familiar script, in which an idealistic student in the role of David confronts a corporate Goliath of a school, but in most cases, Goliath wins. Under such a grievance process, there can be little doubt which way the arbitrator would rule. While the stories of students like Jacob, Debbie, and others are increasingly making their way into the public eye, little is known about the enrollment contracts and restrictive clauses themselves. Who uses them? What do they say? Forced arbitration clauses. These provisions prohibit students or former students from going to court to seek resolution of any complaints, such as a student seeking a refund for an inadequate education. Instead, the college requires students to take any complaints to an arbitrator in a private, binding process. Go-it-alone clauses. When these provisions are included in enrollment contracts, students and former students who have complaints are not allowed to join with peers who may have similar complaints against the school (such as through a group or class action). Instead, the contractual provision requires each student to seek resolution alone. Gag clauses. These provisions prohibit students or former students from telling other people about the complaint-resolution process, or about the specifics of any final ruling. 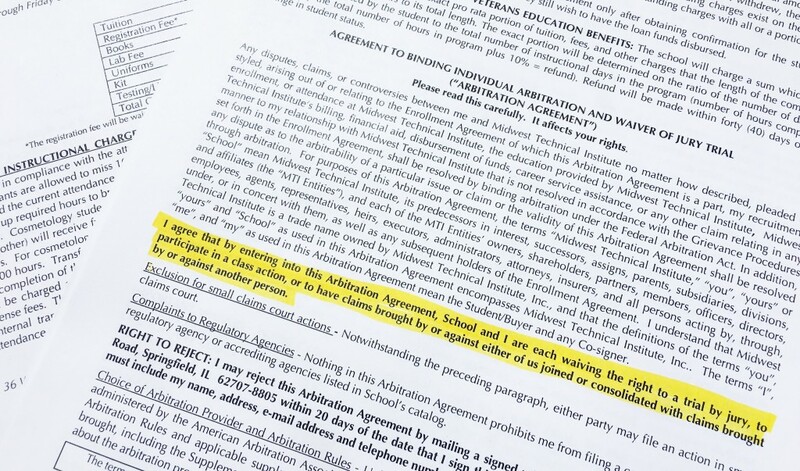 These types of agreements have long been common in settlements of disputes, but they are now appearing in contracts and other documents that colleges require students to sign as a condition of enrollment, before a dispute even arises. Internal process requirements. While all colleges encourage students to make use of internal grievance procedures, these provisions prohibit students from taking their complaints to other forums for resolution without first going through the school’s internal process. We also found that, while these types of restrictions were frequently imposed by for-profit colleges participating in the federal financial aid program, they were used only rarely at traditional nonprofit colleges or at for-profit colleges not using federal funds, and almost never at public institutions. Table 1 shows the ten largest schools from our sample using at least one restrictive clause— all are for-profit colleges, receiving nearly $8 billion from the U.S. Department of Education in 2013—14. Source: Office of Federal Student Aid, U.S. Department of Education https://studentaid.ed.gov/sa/about/data-center/school/proprietary. Arbitration was originally intended as a way that two parties could resolve a dispute without the cost and delays that can be involved in going to court. Different from mediation, an arbitrator has significant legal authority, and can limit essential aspects of a trial, including discovery and presentation of evidence. Once an award is decided, appealing the finding can be extremely difficult. Arbitration can be a reasonable approach when two parties, such as two companies negotiating a contract, know what they are getting into and what the possible disputes may involve. Arbitration is forced or mandatory when it is agreed to before any dispute exists and when it is part of a standard contract presented to one party on a take-it-or-leave-it basis, such as in a consumer contract or employment contract. Because of this conflict of interest and other restrictions on consumers’ rights in arbitration, forced arbitration clauses have become a shield that invites abuse by businesses, rather than the efficient dispute-resolution process that was originally intended. 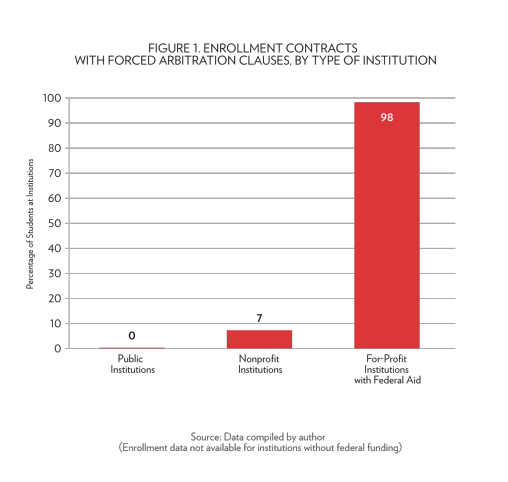 Our survey found that forced arbitration clauses are far from ubiquitous in higher education. (See Figure 1.) Indeed, we did not find even one public university that requires students to commit to arbitration as a condition of enrolling, and only one nonprofit college out of thirty-four. At for-profit colleges, the use of forced arbitration depends primarily on whether the school is receiving federal money. Among those that are, most students are required to sign away their right to go to court. A majority of the for-profit schools using federal aid in our sample (93 of 158 institutions) include forced arbitration clauses in their contracts, but those schools enroll a much larger proportion of students from the sample of federally funded for-profit schools (98 percent).4 Of the forty-nine for-profit schools not using federal aid, only one school used a forced arbitration clause. Below are three examples of how forced arbitration clauses appear in the enrollment contracts that students are asked to sign. For Kaplan University, the clause is a single sentence in the signature block, on the second page within the enrollment contract. South University includes multiple paragraphs, including a fully capitalized paragraph within the twelve-page contract it requires students to sign. In its ten-page contract, Paul Mitchell the School, which trains cosmetologists, has a full page on arbitration, requiring students to initial each of ten separate statements. Source: Kaplan University, Enrollment Contract Signature Block. View full contract. Source: South University, Enrollment Contract. View full contract. 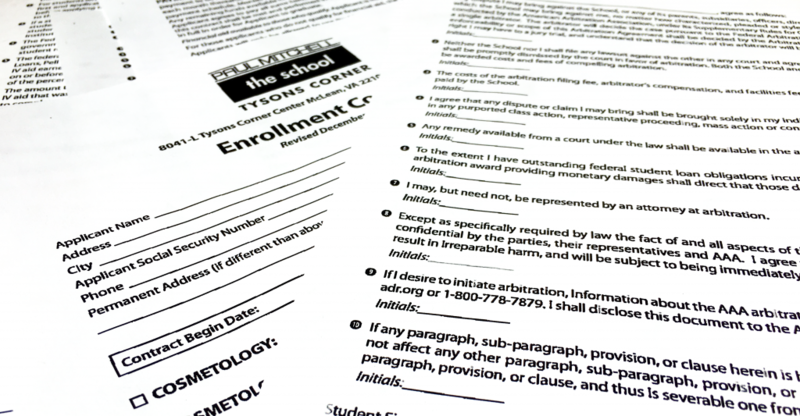 Paul Mitchell School Tysons Corner Enrollment Contract. Photo taken by author. While arbitration clauses—if a school uses them—usually appear in an enrollment contract, there are some schools that make reference to other documents the student is agreeing to, such as a school catalog. We identified five cases in which the arbitration clauses were not included in the enrollment contract, but instead included in the school catalog (which was referenced as binding in the enrollment contract). When individuals have complaints about the practices of a single company or individual, they frequently have the choice of bringing their disputes themselves, consolidating jointly in a single case, or filing representative suits or “class actions.” Group approaches are common in consumer cases because individual consumers often do not have the knowledge or financial resources to pursue a claim. By joining forces, consumers are able to gain the legal representation and evidence they need to make their case. Go-it-alone clauses within enrollment contracts prevent students and former students from being able to seek resolution of their complaints by teaming up with others. Since students or former students who must pursue their complaints individually are much less likely to do so, prohibiting group action enables worse behavior by schools. The patterns we found in the use of go-it-alone clauses are similar to forced arbitration. Public and nonprofit colleges and privately funded for-profit colleges almost never prohibit group action by their students and former students, while more than a fifth of the for-profit colleges using federal aid in the survey required students to seek redress of grievances only in individual proceedings, representing 63 percent of the student enrollment in the federally funded for-profit sample. (See Figure 2.) It is important to note that, due to recent Supreme Court decisions, it is likely that even colleges without a go-it-alone clause in the enrollment contract would argue that the arbitration clause itself prohibits class actions.5 So the presence of an express ban on class action does not sufficiently capture the schools where students will be unable to arbitrate their claims as a class. Although go-it-alone clauses appear in our data less frequently than forced arbitration clauses, this may in part be due to our method of data collection. Specifically, Illinois includes a provision in its communications with vocational schools that discourages the use of these clauses, potentially suppressing the usage rate of go-it-alone clauses among for-profit schools receiving federal aid. Still, the percentage of students enrolled within these schools (63 percent) far exceeds the percentage of institutions using such clauses (22 percent) in our sample. Go-it-alone clauses are usually included within an arbitration clause. As shown below, Midwest Technical Institute includes a section within its enrollment contract specifying that any complainant cannot be part of a class action, or bring claims consolidated with other individuals. Cortiva Institute simply states that any issue will be resolved through individual, binding arbitration, a clarification that, as discussed above, may be redundant. MidWest Technical Institute Agreement to Binding Individual Arbitration and Wavier of Jury Trial. Photo taken by author. Gag clauses prohibit students and former students from sharing information about their complaint—or about the complaint-resolution process—with anyone. While confidentiality agreements are frequently included in settlements to disputes, requiring consumers to keep their complaints secret seems to be a new strategy by companies to prevent tales of the disputes themselves from reaching the media or law enforcement agencies. Like requiring individual rather than group processes, the strategy also inserts a firewall between wronged students, reducing the likelihood that they will learn about each other’s complaints, preventing them from working together to seek a better resolution. We found gag clauses in about one in every ten enrollment contracts at for-profit colleges receiving federal aid. No such provisions were found at nonprofit, public, or privately funded for-profit institutions. Except as specifically required by the laws of the State of Illinois, the fact of and all aspects of this arbitration and the underlying dispute shall remain strictly confidential by the parties, their representatives. I agree that any actual or threatened violation of this provision would result in irreparable harm, and will be subject to being immediately enjoined. Source: Coyne College, Arbitration Agreement. View full contract. All schools have internal dispute processes to help students with issues, and it is good practice to invite and encourage students and former students to use those internal procedures as a first course of action. Some schools, however, are attempting to prohibit their students and former students from ever taking their complaints elsewhere, even if internal mechanisms offer no relief, essentially trapping them at an institution that they may not trust. Our research found sixteen institutions, all for-profits receiving federal aid, included language in their contracts which mandates students to go through the institution’s internal grievance process prior to taking their complaints to arbitration. One way that a school could attempt to enforce this requirement is to argue that relief through arbitration is not available if the student pursues a different route first. In the case of ITT Technical Institute, which has caught the attention of law enforcement agencies for allegedly misleading prospective students,6 the school scolded former students for taking their complaints to the U.S. Department of Veterans Affairs rather than using the agreed-to grievance procedures. In a letter responding to a student’s complaint, ITT said it was responding “even though this is outside of our established Student Complaint/Grievance Procedure,” implying that the student had violated a contractual obligation. “A copy of your complaint sent to the Veterans’ Administration (VA) has been forwarded to my attention. I appreciate the opportunity to respond to the concern(s) you submitted online at http://www.benefits.va.gov/gibill. At the training session, the presenter claimed the full course had a success rate of 97 percent, and he talked about graduates who had doubled their investment portfolios. As the students were counseled individually at the end of the free introductory session, Ralph signed up for the full course of twelve in-person training sessions at a cost of $17,500. According to Ralph, the school representative suggested he keep his wife in the dark about the course if he was truly serious about making a lot of money. Shortly after signing the contract for the course, Ralph mentioned his new endeavor to his relative at The Century Foundation, who reviewed the contract materials and encouraged Ralph to reconsider his decision to enroll. When Ralph sought to cancel the contract, the Online Trading Academy required him to return the contract and other materials before releasing him from his commitment. Snapshots taken of the enrollment contract show that it included a forced arbitration clause and an agreement that “any dispute resolution proceedings will be conducted on an individual basis.” The tuition charge would have been subject to an interest rate of 17.9 percent if it was not paid promptly. Why are enrollment contracts common at for-profit colleges? The original impetus seems to have been consumer protection. We found a number of states that require private postsecondary schools to provide students with a contract that indicates the name and duration of the educational program the student is signing up for, the costs, and the refund policy. Several states include an additional disclosure informing the student that the program does not guarantee employment. Some include a cancellation process for students who change their mind, such as Texas (three days) and California (seven days). The Illinois contract prohibits students from being charged for, or being required to commit to, more than one term at a time. In addition, most or all of the agencies that accredit, primarily, for-profit institutions (the “national” accreditors) require colleges to use enrollment contracts, with consumer protection as the purported rationale. We found no state or accreditor that requires contract provisions that restrict students’ rights. Yet notwithstanding its consumer-protection origins, the enrollment contract has become, for some schools, a convenient place to insert legalistic small print that reduces the chances that a school’s wrongdoing will be remedied. The four types of restrictive clauses we detail in this report are not the only provisions we found. National University, for example, the one established nonprofit that uses restrictive clauses, requires enrolling students to “specifically represent and warrant that . . . you have not been promised anything other than what is contained in this agreement or in the Catalog.” If a National University student were to complain that an advertisement or a recruiter’s assertions were misleading, the school would no doubt point to this clause, signed by the student, essentially agreeing to disregard anything the advertisements and recruiters said leading up to the signing of the contract. By adding a sentence or two, an enrollment contract intended as a consumer protection instead becomes a license for dishonest or predatory behavior. Accrediting agencies should consider restrictive clauses in enrollment contracts to be indicators that an institution lacks the integrity to qualify as an accredited institution. State agencies that collect schools’ enrollment contracts should make those contracts publicly available electronically so that they can be used by law enforcement to identify potentially predatory schools, and to can be analyzed by consumer protection experts. When students choose a college, they have every reason to believe that the college is on their side, leading them to academic success and a bright future. A college that takes advantage of students at that optimistic moment, requiring them to sign away their rights, does not deserve taxpayer support. Of the 271 total institutions in the sample, 207 are for-profit, thirty are public institutions and thirty-four are long-time nonprofit institutions. 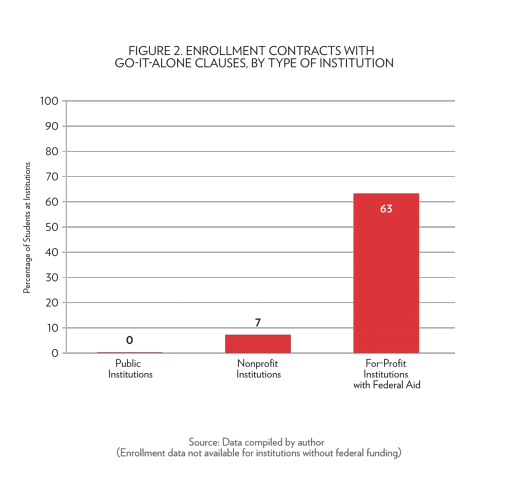 (Three institutions that recently converted to nonprofit are categorized in this report as for-profit, since that is where their business processes developed).17 The high yield of for-profit institutions is due in large part to the fact that some for-profit schools are subject to state disclosure regulations, thus making it possible to collect enrollment contracts in bulk. Public and nonprofit institutions, meanwhile, do not usually use enrollment contracts at all, making it difficult to confirm the lack of a restrictive clause since there is no standard document to inspect. As a result of the variety of methods that were used to assemble the sample, the survey is not likely a precise representation of the full universe of institutions. Molly Hensley-Clancy, “Students Ripped Off By For-Profit Colleges Discover They Can’t Sue,” Buzzfeed, March 29, 2016, http://www.buzzfeed.com/mollyhensleyclancy/students-ripped-off-by-for-profit-schools-cant-sue#.jiOPYX1J0. Jessica Silver-Greenberg and Michael Corkery, “In Arbitration, a ‘Privatization of the Justice System,’” New York Times, November 1, 2015, http://www.nytimes.com/2015/11/02/business/dealbook/in-arbitration-a-privatization-of-the-justice-system.html?_r=0. For more background on forced arbitration, see Consumer Financial Protection Bureau, “Arbitration Study: Report to Congress, pursuant to Dodd–Frank Wall Street Reform and Consumer Protection Act § 1028(a),” March 2015, http://files.consumerfinance.gov/f/201503_cfpb_arbitration-study-report-to-congress-2015.pdf. The proportion of students enrolled calculates the total number of students enrolled in each school system: if multiple locations of an institution appeared in our sample, we only counted that institution once. See the Supreme Court’s decisions in Stolt-Nielsen S.A. v. AnimalFeeds Int’l Corp., 559 U.S. 662 (2010), and Oxford Health Plans, 133 S. Ct. 2064. “ITT Tech Sued for Deceiving Students about Its Computer Network Systems Program and Success in Finding Jobs,” Massachusetts Attorney General, http://www.mass.gov/ago/news-and-updates/press-releases/2016/2016-04-04-itt-tech.html. State Authorization Reciprocity Agreement, Policies and Standards, Section 4(2)(a) and Section 7, dated February 17, 2016, http://nc-sara.org/files/docs/NC-SARA_Policies_Standards.pdf. Margaret Mattes, “Bad Deal on Online Education Would Leave New Yorkers Unprotected,” The Century Foundation, March 16, 2016, https://tcf.org/content/commentary/bad-deal-on-online-education-would-leave-new-yorkers-unprotected/. College Navigator, National Center for Education Statistics, U.S. Department of Education; National University website, http://www.nu.edu/Locations.html. While a 2013 enrollment contract from National included forced arbitration, a contract dated 2011 did not. A clip from the infomercial is available at http://www.scripttoscreen.com/vimeo-video/online-trading-academy-drtv-long-form-show/. United States Court of Appeals, Ninth Circuit, Makaeff v. Trump, April 17, 2013, http://caselaw.findlaw.com/us-9th-circuit/1628150.html. Students applying for early decision are committing to enroll in a particular college if they are admitted, and are allowed to make such a commitment to only one college. In applying early decision, the student along with the parent and a counselor must sign a standard form that is part of the Common Application. See the “Early Decision Agreement” contract at http://admissions.duke.edu/images/uploads/process/ED_agreement.pdf. Public Citizen, “Citizen Petition,” February 24, 2016, http://www.citizen.org/documents/Citizen-Petition-to-ED-Title-IV-Arbitration-Clauses.pdf. These were the states that responded to our document requests in time for inclusion in the survey. United States Senate Health, Education, Labor, and Pension Committee, “For Profit Higher Education: The Failure to Safeguard the Federal Investment and Ensure Student Success,” July 30, 2012, http://www.help.senate.gov/imo/media/for_profit_report/Contents.pdf. We asked states for the most recent, approved contracts from state agencies. However, some agencies reported difficulty in supplying the most recent contracts. Therefore, some contracts collected may be older versions. Everest University, Herzing University, and CollegeAmerica all recently converted to nonprofit tax status, two were discussed in The Covert For-Profit; see Robert Shireman, “The Covert For-Profit,” The Century Foundation, September 22, 2015, https://tcf.org/content/report/covert-for-profit/. Integrated Postsecondary Education Data System, National Center for Education Statistics, U.S. Department of Education.